Pet Peace of Mind is a national organization based in Salem, Oregon. Niagara Hospice is a participating hospice in the program and received a grant from Pet Peace of Mind that funds a variety of pet-related services to help patients and families. 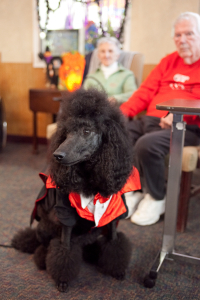 This program was developed to keep pets and patients together during hospice care. It provides pet food, veterinary care and other pet care services at no cost to the patients. Volunteers are specially trained to provide in-home pet care assistance when the patient needs help. Niagara Hospice is proud to be a part of the Pet Peace of Mind nationwide network and committed to supporting the wishes of patients so they don't have to worry about their pets. People with veterinary technician or animal shelter backgrounds can become volunteers in the program. For more information, please call our volunteer department at 280-0748.